The authors of Leading From Your StrengthsTM help parents-and their children-build harmony and head off potential conflicts by introducing some of the same tools and insights that have helped hundreds of ministry teams become closer and more connected. The Global Parenting Plan (GPP) draws on the imagery of Global Positioning devices, "triangulating" a person's position by getting a reading from three known positions: God's unchanging Word, their unique parenting strengths, and the way each child is "fearfully and wonderfully made." By drawing on these factors parents can draw closer to each other and be even more effective in "training up a child." 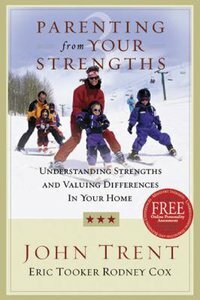 About "Parenting From Your Strengths"
John Trent (PhD., North Central Texas Federation of Colleges and Universities) is president of StrongFamilies.com and The Center for StrongFamilies, a training center in Scottsdale, Arizona, where lay leaders, counselors, and pastors are trained to become StrongFamily Coaches in their churches and corporate settings. Dr Trent is a much sought-after speaker on the topics of building strong relationships and strong workplace teams. He has authored and coauthored more then a dozen award-winning and best-selling books for adults and children. His books include The Blessing, The 2-Degree Difference, Chasing Skinny Rabbits and The Treasure Tree. John has been a featured guest on numerous radio and television programs across the country. He and his wife, Cindy, have been married for more then twenty-eight years and have two daughters. Rodney Cox is the CEO of Insights International, Inc. and co-creator of the Leading From Your Strengths on-line strengths assessment. He also has over 18 years of sales and management experience. Rodney has devoted the last 15 years to understanding how individual behavior impacts relationships. He has co-authored a series of books entitled Leading From Your Strengths and currently speaks nationally and internationally, helping people understand the divine design for relationships. Eric Tooker is president of Ministry Insights International, primarily responsible for the business operations. He is a graduate of the University of Michigan Law School. Eric and his family live in Scottsdale, Arizona.